Morven was this month's hostess for the Daring Bakers challenge, and she picked a recipe from Baking: From My Home to Yours, a cookbook I keep giving as a gift but don't actually own... yet. After the way this cake turned out, I know this cookbook will become a staple. "Da Lime in Da Coconut Cake." 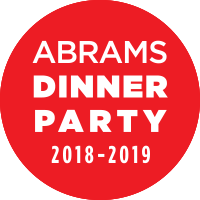 Now that that's over, I can talk about the changes I made to the recipe. I didn't have cake flour at home, so I used all-purpose flour with the recommended change of simply removing 2 tbsp from each cup of flour. It worked wonderfully - the end result was beautifully risen and very tender, probably because of the baking soda reacting to the buttermilk, but still - what a great end result. Instead of lemon juice, I used lime; instead of lemon zest I used lime again. Instead of vanilla extract, I used coconut. Other than that the recipe was the same, down to using raspberry jam slightly stirred. 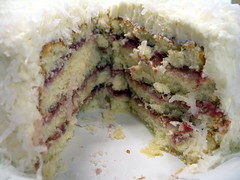 There was one step that I completely screwed up on, and didn't realize it until I had all of my layers stacked with jam in between The recipe actually asks you to spread buttercream between the layers as well as on the sides and top. I didn't want to risk taking the layers apart, and personally I thought this helped cut down on the super sweetness of the cake, but wouldn't want to let Dorie down. This is not a healthy cake. If you use all the icing, this recipe has an entire pound of butter in it! But the texture of the cake and the perfect texture of the cooked buttercream makes this the perfect party cake indeed. I brought this to work and witnessed several people going back for a second slice before they'd even had lunch (a clear sign of a good recipe!). 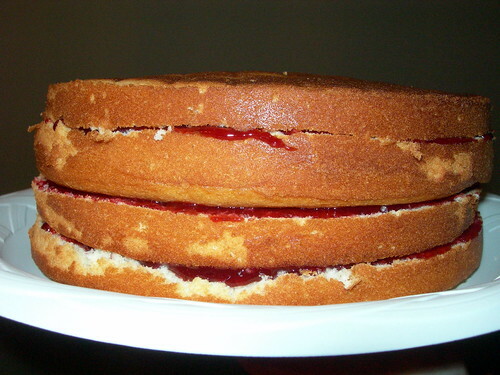 In the future I will definitely make this recipe again - I want to try making a chocolate version, a peanut butter and jelly sandwich cake version (I'm thinking I can substitute peanut butter for one of the sticks of butter in the icing but we'll see if that works! ), and a sacher-torte version. What makes this a perfect party cake? Well, besides the fact that the flavor and texture are exquisite, it looks impressive but also travels well - never underestimate the value of coconut to act as an icing buffer and protector! 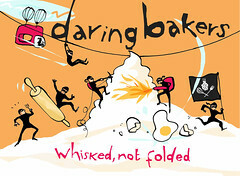 I know some of the other Daring Bakers have really done some creative things with this recipe, and you can check them out here. ETA: For those of you who have a LiveJournal account, you can add this blog to your friends list here. With all the baking blogs I read, I often come across recipes I can't get out of my head. 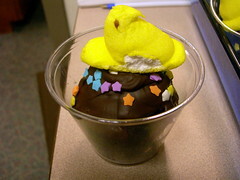 When Laurie from the Quirky Cupcake blog posted about her entry for the Fierce Cupcake Challenge, including a Peeps vs. Bunnies war, I found myself going back to it just to have another giggle. I like to make treats for my student workers and have been on a cupcake kick this year, so this seemed perfect. When I was running out of steam Tuesday night I started thinking about just making a normal buttercream for the top, but followed through on the recipe. It starts with a normal enough chocolate cupcake, but then you make a cooked meringue that goes on top (making them look more like ice cream cones than cupcakes... this is where the hi-hat name comes from), then they are dipped in chocolate, and topped by sprinkles. And Peeps, in my situation. The end result is a cupcake sweeter than you would believe - the meringue is more like a marshmallow, and I'm pretty sure everyone who ate one left for Easter Break on a huge sugar high. I was going to wait until Easter and post something about an amazing masterpiece that I was sure I would put together - but I am just not in a baking mood tonight, so this might be it! There are certain foods I crave when I am feeling stressed - chocolate (always) and breakfast. This pancake recipe makes such a thick batter you almost can't call them pancakes, but then you do and justify eating them for breakfast. By the way, I blame my pancake craving entirely on this entry in the Cream Puffs in Venice blog. She is someone whose blog I never miss, and while I have yet to try her ricotta pancakes recipe, I couldn't not make pancakes after seeing this entry. When you click on the link to the recipe, you will note that it is a Rachel Ray recipe. So sue me. Some of her recipes are pretty good. If you are still developing your baking abilities, there is little you can do to mess up on pancakes. All the ingredients are stirred together in a bowl. 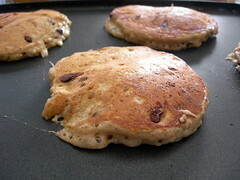 As long as your griddle is hot enough and you don't turn them too soon, you should have delicious pancakes in no time! I have mentioned before that my day job is being a librarian - here is a food research tool for you! A few people have taken advantage of the Google custom search and created a food blog search. It is a great way to look for recipes. I've added it to the side bar of my blog so you can use it any time.